Two fungal canker diseases are common on various types of evergreen trees. A canker is an area of dead bark on a limb or trunk of a tree. On evergreens, cankers usually are visible as areas on the bark leaking abundant white, sticky resin. When a canker grows all the way around the limb, it girdles the limb, killing it. We usually first notice canker diseases when several scattered branches on the tree die. 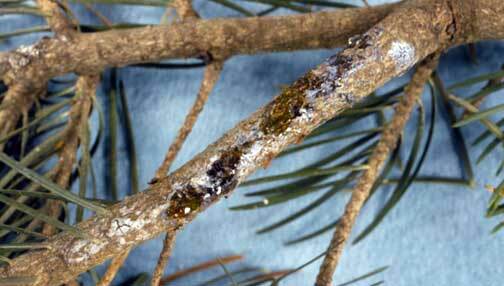 Two fungi cause most of the canker diseases found on evergreens. The fungus Sphaeropsis (also called Diplodia) causes cankers on pines, especially Austrian pines, as well as concolor firs. The fungus Cytospora is the most common cause of cankers on spruces. Both fungi kill sections of the bark of the tree, causing scattered branch death, or death of large sections of the tree if the canker occurs on the trunk. Fungal cankers almost always occur on trees weakened by other stresses, particularly drought stress. The best way to avoid canker diseases is to keep trees as unstressed as possible. This begins with choosing an appropriate tree for the site, and planting the tree properly. Watering the tree during especially dry periods can help to prevent drought stress. Applying a three-inch layer of organic mulch over the rootzone can also help to moderate the soil moisture level and temperature, further minimizing stress. Spruce with scattered dead branches caused by Cytospora canker. When cankers are found, the cankered limbs should be pruned from the tree, to help reduce the amount of fungus in the tree. Steps to reduce further stress on the tree should be taken. Fungicides are not effective against canker diseases. 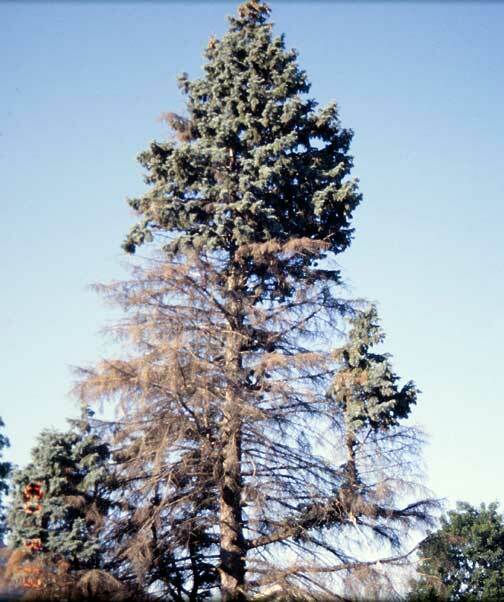 Spruce with extensive branch death caused by Cytospora canker. For more information on cankers, see the bulletin Fungal Cankers of Trees. Sphaeropsis (Diplodia) canker on concolor fir, showing oozing of sticky resin. Links to this article are strongly encouraged, and this article may be republished without further permission if published as written and if credit is given to the author, Horticulture and Home Pest News, and Iowa State University Extension and Outreach. If this article is to be used in any other manner, permission from the author is required. This article was originally published on February 21, 2007. The information contained within may not be the most current and accurate depending on when it is accessed. 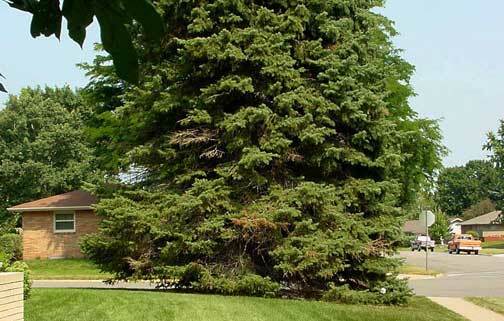 When Should I Spray Conifers for Needle Diseases?